Ted Leo is doing it right. The man’s been rocking for over 20 years, and it’s still guaranteed that at any given show, he will play the songs you want to hear, rock out until he has sweated through his shirt or his face is bleeding (yes, this really happens), and will be engaging and generally happy to be on stage, doing what he always dreamed of doing when he grew up—being a rock star. Beyond filling the obvious criteria for being a great performer, Ted Leo is a principled artist, brilliant lyricist, and great musician. He has been deeply committed to releasing his music on independent record labels and steering clear of playing corporately-owned venues. His lyrics are oftentimes packed with powerful political messages and he has recently been active in union efforts in Wisconsin and the Occupy Wall Street movement. But most importantly, Ted Leo makes music personal. To read his website is to learn who Ted is as a person—he tells of his early trials of traveling around as a one-man act, playing music on top of cassette tapes of backing sounds and shares old pictures, stories, and memories. He interacts with his fan base constantly through Twitter, and a friend of mine tells the story of how when MySpace was the newest fad, Ted got in touch with fans to meet up in person and hang out. Ted Leo is loyal. 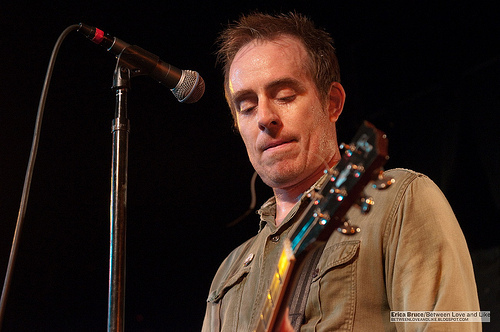 On April 27th and 29th, Ted Leo and the Pharmacists played two sold-out shows at DC’s Black Cat. They surely could have played a larger venue, but as he explained during his set, he has a long history with the club. On Friday night, Leo explained to those assembled that “there are three clubs without which [he] would be doing something else with his life”—the Middle East in Cambridge, Massachusetts, Brownies in New York City, and the Black Cat. As fans, we’re lucky that Ted Leo won’t settle for ‘good enough’ and is always striving for perfection and to hold true to his core beliefs. It makes for a musician we can really get behind, albums that motivate us and cut through to our deepest emotions…and one hell of a live show.